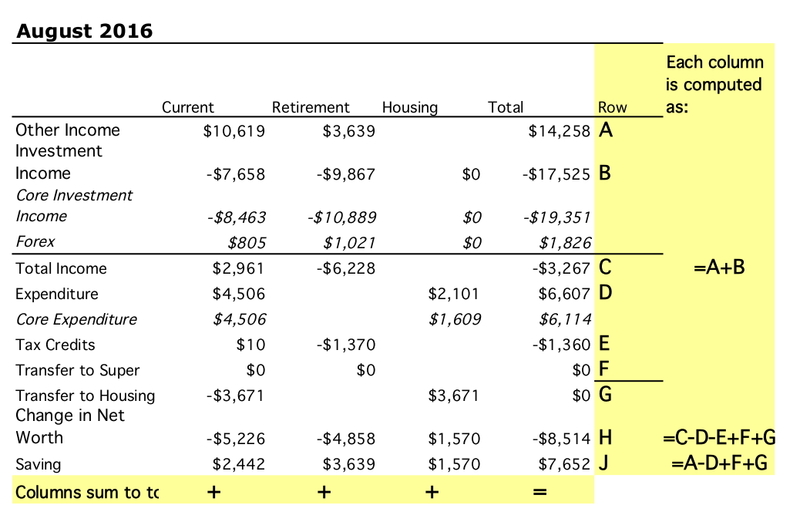 Spending (not counting mortgage) was low at $4.5k. Again, no large and exceptional purchases this month. Salaries etc. added up to $10.6k. After taking into account the mortgage payment of $3.7k (which includes implicit interest saving due to our offset account - the actual mortgage payment was about $500 less than this) - which shows up as a transfer to the housing account, we saved $2.4k on the current account. 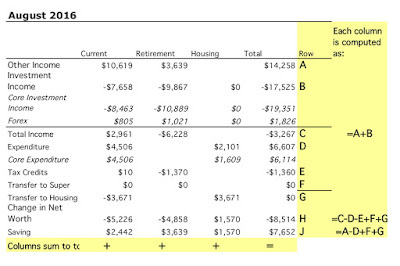 We made $3.6k of retirement contributions , and saved a net $1.6k in added housing equity. Net saving was, therefore, $7.7k across the board. The Australian Dollar was fairly stable falling from USD 0.7598 to USD 0.7520. The ASX 200 fell 1.55%, the MSCI World Index rose 0.39%, and the S&P 500 rose 0.14%. We lost 1.25% in Australian Dollar terms and 2.26% in US Dollar terms. So we outperformed the Australian market and underperformed the international markets. The best performing investment (in total dollars not RoR) was the PSSAP superannuation fund, which gained $1.9k followed by Oceania Capital Partners, which gained $1.5k. The worst performer was the CFS Geared Share Fund, losing $17.3k followed by Platinum Capital, losing $4.3k. The best performing asset class was AUstralian small caps, which gained 2.64% and the worst hedge funds, which lost 2.79%. As a result of all this, net worth fell AUD 8k to $1.592 million or fell USD 19k to $US 1.197 million.